For The Love Of Pork: Antibiotic Use On Farms Skyrockets Worldwide : Goats and Soda For the first time, scientists have estimated the amount of antibiotics pigs, chickens and cows consume globally — and how fast consumption is growing. Which country uses the most drugs on farms? Regions that produce the most pork and chicken also use the most antibiotics on farms. Hot spots around the world include the Midwest in the U.S., southern Brazil, and China's Sichuan province. Yellow indicates low levels of drug use in livestock; orange and light red are moderate levels; and dark red is high levels. Sorry bacon lovers, we've got some sad news about your favorite meat. To get those sizzling strips of pork on your plate each morning takes more antibiotics than it does to make a steak burrito or a chicken sausage sandwich. The love of meat is exploding in Asia, and with it, comes antibiotic consumption by chickens (top) and pigs (bottom). Green represents low levels of drug used; yellow and orange are medium levels; and red and magenta are high levels. Pig farmers around the world, on average, use nearly four times as much antibiotics as cattle ranchers do, per pound of meat. Poultry farmers fall somewhere between the two. That's one of the conclusions of a study published Thursday in the Proceedings of the National Academy of Sciences. It's the first look at the amount of antibiotics used on farms around the world — and how fast consumption is growing. The numbers reported are eye-opening. In 2010, the world used about 63,000 tons of antibiotics each year to raise cows, chickens and pigs, the study estimated. That's roughly twice as much as the antibiotics prescribed by doctors globally to fight infections in people. "We have huge amounts of antibiotic use in the animal sector around the world, and it's set to take off in a major way in the next two decades," says the study's senior author, Ramanan Laxminarayan, who directs the Center for Disease Dynamics Economics & Policy in Washington, D.C.
With half of the world's pigs living in China, the country tops the list as the biggest antibiotic consumer in farming. The European Union banned the use of antibiotics to boost animals' growth in 2006. At first, the ban had little effect on the amount of drugs given to pigs. But the U.S. isn't far behind in second place, using about 10 percent of the world's total. Brazil, India and Germany round out the top five for farm animal consumption of antibiotics. What frightens Laxminarayan is the huge rise in farm drug use, especially in middle-income countries. "We project in the next 20 years, world consumption of antibiotics in animals will go up by two-thirds," he says. "The implications for the effectiveness of our antibiotics could be quite devastating." As people around the world get richer, they want to eat more meat. Who can blame them, right? But all those extra chicken wings and pork chops come primarily from factory farms. At the same time, drug use on farms is essentially a free-for-all. "In most countries around the world, there's virtual no regulation for antibiotic use on the animal side," Laxminarayan says. One exception is the European Union, which banned drugs to boost animal growth. Farmers there can still give animals antibiotics to prevent infections. Here in the U.S., the Food and Drug Administration is following the EU's example and working to end the use of antibiotics to promote animal growth. But critics say policies passed so far rely on "voluntary cooperation," not binding regulation. "You can actually go to the Eastern Shore [of Maryland near] Washington [D.C.] and buy antibiotics in sacks, or in pounds, for your chickens," he says. "They're literally the same antibiotics you get at a pharmacy with a prescription but at a far lesser cost." Most of the drugs in animals are used at very low concentrations, mixed with food and water. "It serves as a substitution for good hygiene and herd health on factory farms," Laxminarayan says. "But we've found that when animals have good nutrition, good genetics and there is good hygiene on the farm, the added value of antibiotics is quite minimal." The more antibiotics used in agriculture worldwide, the more drug-resistant bacteria emerge on farms — and sewage systems and water supplies. Pharmaceutical companies and agricultural groups say there's no evidence that these drug-resistant bacteria are a threat to people's health. And Laxminarayan agrees there's little direct evidence that antibiotics in animals hurts people. "But the circumstantial evidence, linking use in animals to drug-resistant bacteria in humans, is exceedingly strong," he says. Just a few years ago, scientists in Arizona showed that a methicillin-resistant strain of Staphylococcus aureus in pigs had started infecting farmers. 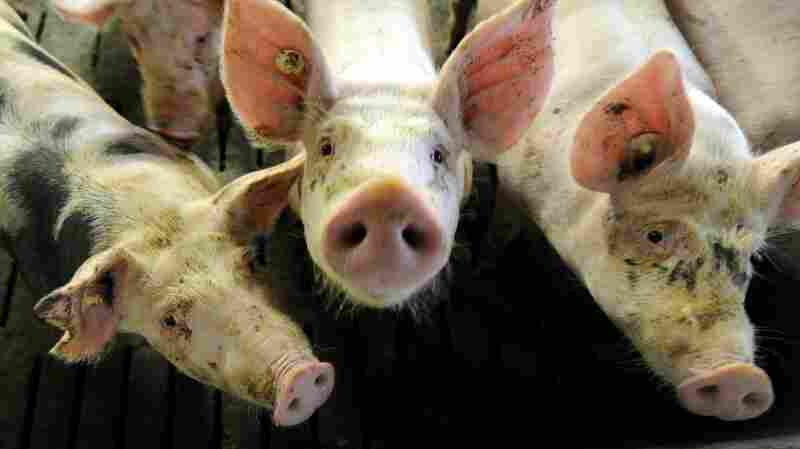 The "pig MRSA" accounts for only a small proportion of human infections worldwide. But scientists think it has the potential to spread.